Triangle Tesla will be holding a lunch at Mad Boar restaurant in Wallace, NC for all Tesla owners that wish to attend. This lunch is not limited to club members and we welcome all Tesla owners from anywhere! Hopefully some owners from coastal and surrounding areas will be able to join us. River Landing, the owner of the Mad Boar restaurant, is excited to have us come and is extending a complimentary offer of 9 holes of golf to any interested Tesla owners on the day of the lunch. This, of course, is completely optional. We do not share your contact information with River Landing (or anyone for that matter). The lunch was originally planned as a pre-pay buffet but has since changed to a non-buffet lunch from the menu, with everyone paying their own bill at the restaurant. Those that pre-paid already have been refunded. We still need an accurate count to convey to the restaurant so please register if you are interested in coming. Lunch is tentatively planned to be from 12-2. After lunch we may go socialize by the cars or linger in the restaurant for a while. We may possibly move to another location, but nothing is planned yet. Some folks will likely take advantage of the complimentary golf offer. Owners coming from the Triangle area have the option of meeting up at the Starbucks in White Oak Crossing shopping area just off I40 in Garner. (180 Cabela Dr, Garner, NC 27529) The current planned meeting time is by 10 AM and we will depart to drive down to Wallace at around 10:15 AM arriving at the restaurant at around 11:30 AM. 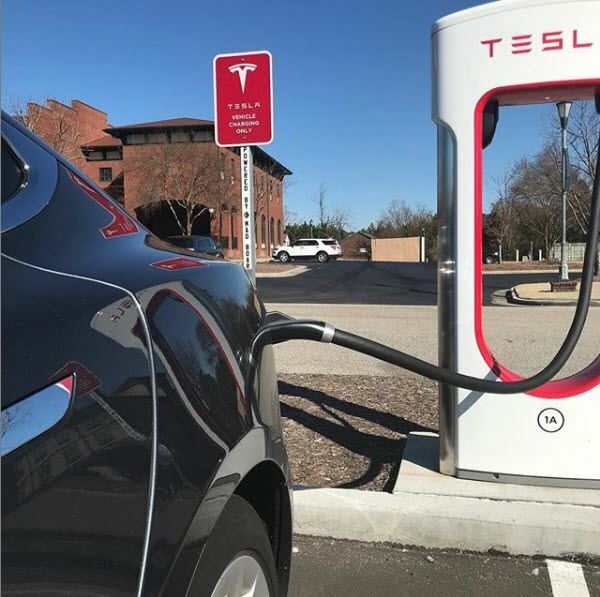 Charging your Tesla will be no issue with an 8 stall supercharger located right next to the restaurant.